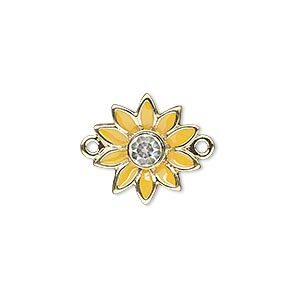 Link, gold-finished "pewter" (zinc-based alloy) / Swarovski® crystal rhinestone / enamel, yellow and crystal clear, 16x15mm single-sided flower. Sold individually. Item Number: H20-A2624FN Have a question about this item? 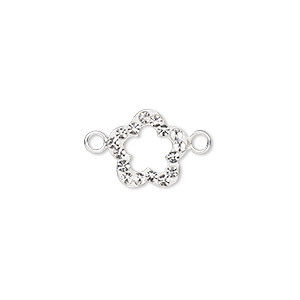 This delightful flower link features glossy enamel color and a Swarovski crystal rhinestone center. Link is made from a "pewter" (zinc-based alloy) base with a gold finish. 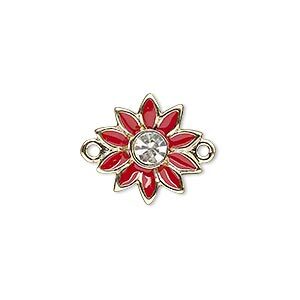 Link, gold-finished "pewter" (zinc-based alloy) / Swarovski® crystal rhinestone / enamel, red and crystal clear, 16x15mm single-sided flower. Sold individually. Link, gold-finished "pewter" (zinc-based alloy) / Swarovski® crystal rhinestone / enamel, purple / green / crystal clear, 23x15mm single-sided flower and leaves. Sold individually. 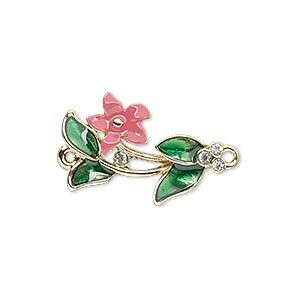 Link, gold-finished "pewter" (zinc-based alloy) / Swarovski® crystal rhinestone / enamel, pink / green / crystal clear, 23x15mm single-sided flower and leaves. Sold individually. Link, enamel / Swarovski® crystals / silver-plated "pewter" (zinc-based alloy), purple and crystal clear, 16x15mm single-sided flower. Sold individually. Link, enamel / Swarovski® crystals / silver-plated "pewter" (zinc-based alloy), blue and crystal clear, 16x15mm single-sided flower. Sold individually. Link, enamel / Swarovski® crystals / silver-plated "pewter" (zinc-based alloy), yellow / green / crystal clear, 23x15mm single-sided flower and leaves. Sold individually. Link, enamel / Swarovski® crystals / silver-plated "pewter" (zinc-based alloy), purple / green / crystal clear, 23x15mm single-sided flower and leaves. Sold individually. Link, enamel / Swarovski® crystals / silver-plated "pewter" (zinc-based alloy), white / green / crystal clear, 23x15mm single-sided flower and leaves. Sold individually. 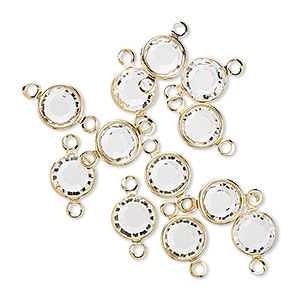 Link, crystal / epoxy / sterling silver, clear and white, 10mm single-sided flower. Sold individually.